What it’s about: Daikichi arrives at his grandfather’s funeral to find a surprise guest – his grandfather’s illegitimate six-year-old child, Rin. None of the family knew that she existed, and none of them have any idea what to do with her now. When the idea of looking for an orphanage is raised, Daikichi steps up and offers to take Rin in himself until something better can be found. But he already has a job with long hours and has no idea what raising a child entails. 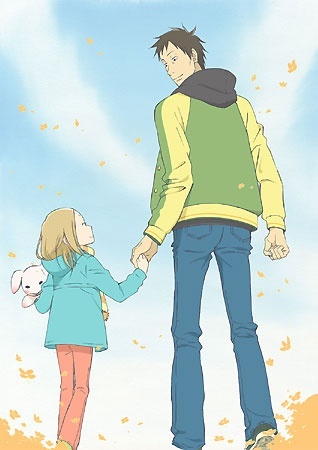 Why you should watch it: Usagi Drop is quite possibly the most heart-warming and adorable story I’ve ever seen put to animation. If you can watch the whole thing without even idly imagining yourself in Daikichi’s shoes, I’m not sure that parenthood is for you. 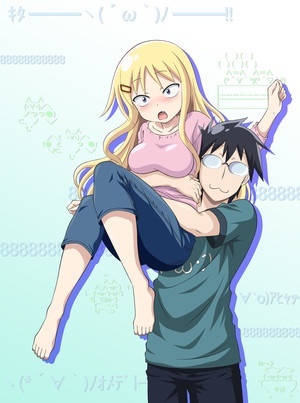 This is a pure slice of life show – it never strays into outright comedy, romance, or any of the other genres that SoL shows tend to hybridise with, though there are elements of all of them scattered throughout. The script lends itself well to natural and affecting performances by the voice actors. But it’s the characters are truly what sell the show, from Daikichi and Rin themselves to the friends they make and the family who inevitably involve themselves in Daikichi’s life. Caveats: This is a pretty simple show at heart. In all honesty, it benefits very little from being animated rather than live-action. And the studio seems to have taken the opportunity of the lower demands that this entails to be a bit looser with the animation and musical score. Episodes switch between basic watercolour backgrounds and barebones character designs to merely average versions of both. That said, they largely get away with it; the show itself doesn’t lose much by not being the most visually stunning thing out there. Themes: Parenthood. The rewards, costs, and stresses of raising a child alone. The importance of family. What it’s about: The police arrive at a school to find a classroom full of dead children, with only one survivor – a young boy named Ganta. The evidence of his guilt is overwhelming, despite his protestations of innocence, and the verdict is both swift and decisive. Death. The sentence is to be carried out at Japan’s only private prison, Deadman Wonderland, where inmates must participate in death games for the amusement of tourists. Why you should watch it: This is an action show through and through. It pulls no punches, with deaths, fights and assorted ultraviolence in nearly every single episode. The conflicts and threats that Ganta faces are continually ramped up, and every time he begins to get a handle on his current situation, a new wrench is thrown into the works. The characters are entertaining in their insanity (and Shiro is adorable), and there’s a mystery to be solved under the surface of the story, but it’s the fight choreography and the fluid animation of the action scenes that are the major draws for the show. Caveats: This is not a show you should try and watch with a 480px pirated stream; there are a *lot* of dark scenes – not thematically speaking (though that’s true too) – but in a literal sense of having the screen mostly black. Watching it on BluRay helps with the contrast but, annoyingly, there doesn’t seem to be a single release without some degree of gore censorship. Finally, the series ends quite abruptly. While it settles all of the immediate conflicts, it feels a lot like the first half of a story than a solid conclusion. But there’s always the manga to turn to if you want more. Similar works: Mirai Nikki, Btooom!, Elfen Lied. Outside of anime, The Hunger Games. What it’s about: They call him “Smile”, because he never does. While not as personable or charismatic as his friend and fellow club member Peco, Tsukimoto has begun to attract attention from the bigger ping pong societies as a potential pro-player. But his heart isn’t in the game; he lost his reason to play some time ago, and he’s fully aware that to reach the heights of any sport, one must be prepared to sacrifice everything else. Why you should watch it: This is a sports anime, and simultaneously it isn’t. 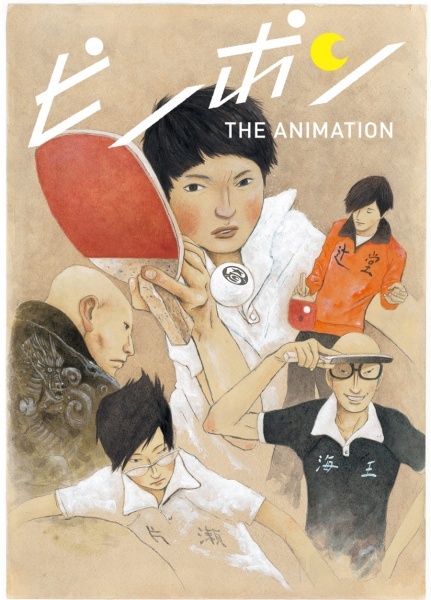 Unlike the standard entries in the genre, Ping Pong does not obsessively detail strategies and gameplay – it uses the sport as a lens through which to view the protagonists themselves. Every single character in the ensemble cast is both heroic and monstrous, obsessed in their own way, many willing to sacrifice everything they are upon the altar of the sport they love. Masaaki Yuasa is one of the most supremely self-confident directors in Japan today, and he’s one of the few willing to treat anime more as a medium than a genre, employing the tools that animation provides without indulging in the clichés. I’d be willing to say that Ping Pong is his masterpiece. The cinematography and soundtrack are without peer, and the show is one of those works where every element complements and builds off of the others to create a greater whole. If you want to see some of the best that anime has to offer as a medium, and if you have any interest in character dramas at all, Ping Pong is a show that you just have to watch. Caveats: The art style is pretty polarising. The character designs are oftentimes quite ugly at first glance. But give the show a few episodes and you’ll find yourself warming up to it, particularly with the fluidity it lends to the game scenes themselves. Themes: What does it take to succeed? Ambition? Talent? Passion? Hard work? No matter what you bring to the table, there will always be someone who has sacrificed just as much and is willing to continue doing so if it’s what it takes to win. The question is, at what point is it no longer worth it to you to carry on, and can you live with yourself if you don’t? Similar works: Chihayafuru. The execution also reminds me a lot of the Monogatari series, though instead of exploring the mind of a sexual deviant, it explores competition and obsession. What it’s about: Every five years, the various alien races of the galaxy are brought together by their love of racing, with the infamously deadly and spectacular *Redline* race. “Sweet” JP, a rockabilly racer with a fondness for driving a Transam souped up by his childhood friend and mechanic Frisbee. But is the clean weapons-free driving he gained his nickname for going to be enough to survive the upcoming Redline race, which is to be held in the territory of a hostile military power? Why you should watch it: Many sports series use the genre as a jumping off point to expore other themes. Not Redline. This is a racing story through and through. The biggest draw of the film by far is its animation, which is unlike anything seen in anime before or since. It draws heavily on Western graphic novel styling, all bright colours and harsh shadows. The common anecdote is that it took six years to complete, and it really shows. It’s a non-stop adrenaline ride where the characters and plot are there to serve the spectacle, and not the other way around. That’s not to say that either are bad, it’s just a film that knows its strengths and plays to them. This is not a movie that would benefit from overly complex character progression or plotting. 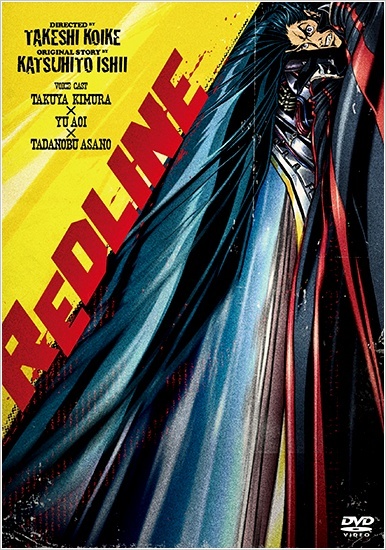 Caveats: If there’s any anime out there where you don’t want to skimp on resolution quality, it’s Redline. Don’t resort to fuzzy garbage-level streams; use a premium service or just go and buy the DVD – it’s not that expensive. Themes: Nothing particularly deep here. Doing what you love and sticking by the people you care about. Similar works: Not much, really. There’s Trava, which is a side-story exploring the background adventures of another of the Redline racing pairs. What it’s about: Haruka and Yuu have been best friends for most of their lives. After transferring into the final intake of a high school due to be closed, Haruka is worried that their friendship won’t survive the transition. As a sign of how serious the two are about each other, they make a dare to kiss one another in an abandoned classroom. From there, their relationship only gets deeper, but they have to keep it a secret from their classmates and families. 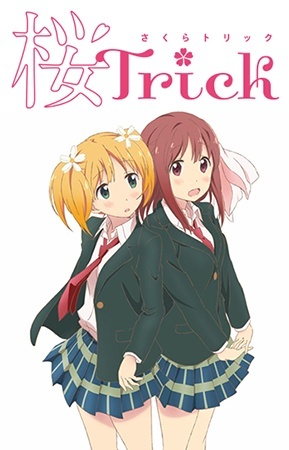 Why you should watch it: Sakura Trick is one of the most adorable romcoms that I’ve seen in a long time. The key ingredient to the whole mixture is the innocence of the relationship, though having two or more extended kissing scenes in every episode certainly makes a nice counterpoint to the “show no progress” mentality of most such shows. The animation is simple but bright, and the comedy of the show is endearing. If you want a case of the warm fuzzies, pick up the show at your convenience. Caveats: Each episode is broken into five-minute “sketches” with only a loose overarching continuity. There’s no real long-running storyline here, though certain elements continue to develop as the show goes on. Themes: Blurring the line between friendship and romance. What it’s about: Some years ago, something strange happened. Across the world, the force of gravity suddenly flipped, and thousands of lives were lost as people and buildings “fell” into the open sky. Of those affected by the inversion, only a handful – those who were lucky enough to be in shelter – survived, and have since retreated underground. They live their lives upside-down, knowing that only a thin skin of earth separates from from the gaping void below. Why you should watch it: This is science fiction as it should be – an imaginative, speculative concept made real and put on the screen for all to see. The animation and background art are gorgeous, with particular attention paid to shots of the sky that’s so terrifying and mysterious to both halves of the cast. But it’s the cinematography that’s most intriguing. 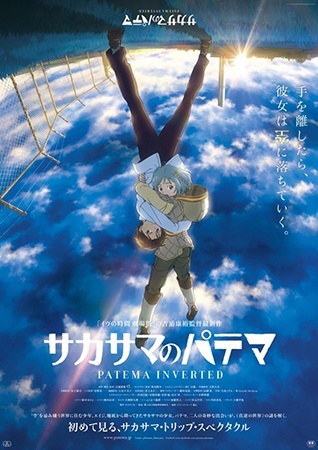 The movie really can be watched with your monitor flipped upside-down as, even within the story, the perspective regularly changes to get the audience to focus on a particular character’s viewpoint. The plot itself is a nicely-executed adventure story with a tinge of action and romance, and it’s involving enough that the hour and a half run-time will pass in a flash. Caveats: I wish that the same effort put into the landscapes had been lavished on the character designs. That’s not to say that they’re bad, by any means. Rather, they’re just standard when the world around them is a step above. Themes: Prejudice, rebellion against authority. Seeing things from a different perspective. What it’s about: The Sakurasou dorm has a reputation at Suimei University – it’s where the administration houses its most troubled, desperate, or just plain weird students to keep them out of the way. Sorata has been living in the house for the better part of a year, after refusing to abandon an adopted cat. Now word has come in that a new resident is arriving; a transfer student from England named Mashiro. While extremely artistically talented, it turns out that she’s completely unable to look after herself, and Sorata is left in charge of handling her everyday life. 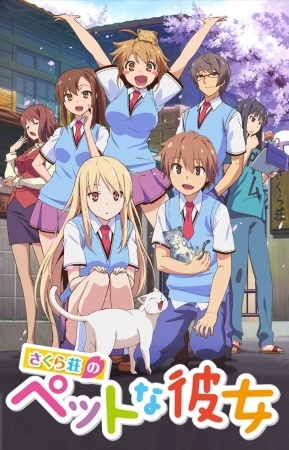 Why you should watch it: Sakurasou has a lot going for it. It’s a slice of life romcom, but those words don’t really do it justice. The heart of the series is in how it plays every member of the core cast off against one another. There’s enough space in the 24-episode run to explore each of the relationships in depth, to build the characters up from their initial impressions into fully-fledged personalities. You really get a sense that these people are friends, rather than actors. And if that’s not enough, the plot of the show is deeper than it appears at first glance, and it addresses its central themes with adroitness. The artwork is warm and bright, and I was quite impressed with the detail that the animators put into the manga, paintings and other artwork within the show itself. Caveats: The romance aspect of the show is a little weaker than the rest, playing off of the typical anime-protagonist indecisiveness and denseness to delay resolution. The show has a moderate amount of fanservice, mostly frontloaded into the first few episodes. Finally, avoid the Coalgirls-subtitled version. The changes they make to the script aren’t really an improvement. Go with the Crunchyroll or Rori subs. Themes: Talent and hard work, in combination and competition. The show deviates slightly from the standard “you can do anything if you try hard enough” anime storytelling approach. It’s remarkably realistic in showing interactions between those with natural talent and those without. At the same time, it’s careful to show that it’s not the be-all and end-all when it comes to living happily. What it’s about: Favaro is a bounty hunter with a rogueish charm, surviving on his wits and combat skills. He’s made more than a few enemies in his time, including the relentless former nobleman Kaisar. By pure accident, a young woman of mysterious origins overhears one of his taller tales – about visiting the mythical land of Helheim – and mistakes it for the truth, taking him on as a guide. Why you should watch it: Bahamut was one of the biggest surprises of 2014. By all rights it should have just been another generic card-game adaptation of the kind that we’ve seen dozens of times before. Instead, what we got was a flawlessly animated major action-adventure series reminiscent of Pirates of the Caribbean or The Road to El Dorado. The cinematography and direction are incredible, not just for a card game adaptation but by any standard. The characters are distinct, likeable, and consistent, with clean attractive designs. The story is leavened by a dose of humour (mostly well-executed sight gags), and the world itself is more interesting than I’d expected. It’s just a really fun show to watch. 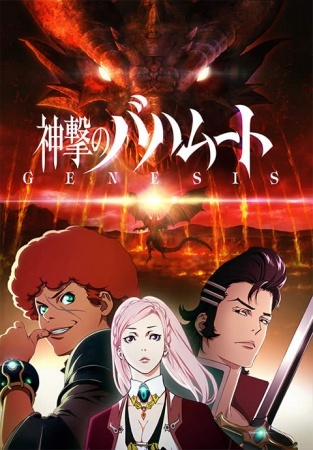 Caveats: Shingeki no Bahamut is at its strongest when the episode isn’t actually progressing the central plot all that much. The story itself is, at its core, a pretty generic fantasy adventure; it’s the character interactions that make the show what it is, and where it rightly spends most of its time. There’s a noticeable dip in the quality of the CGI elements in the middle of the run. But even at its worst, it’s still good television. Similar works: The aforementioned Pirates of the Caribbean. Within anime, Hitsugi no Chaika, Garo: Honoo no Kokuin, and Samurai Champloo.